The night before a race is always a little hectic. Being the first race in almost 6 months I was a bit out of sorts trying to remember exactly what needed to be packed. There is a lot of work to finish up, inspect, and pack. I did make an attempt to put stickers on the kart but the cleaner froze as soon as I sprayed it on making a huge mess of the body. I have talked about a rhythm to a race day and Jason and I fell back into it pretty quickly, enjoying having our time working on a project together. Some families play baseball, garden, or build furniture in the garage, We Race Go Karts. We were the first to arrive and register for the season. Despite the freezing cold and wind, we focused unpacking and began to get the last minute setup and inspection done. 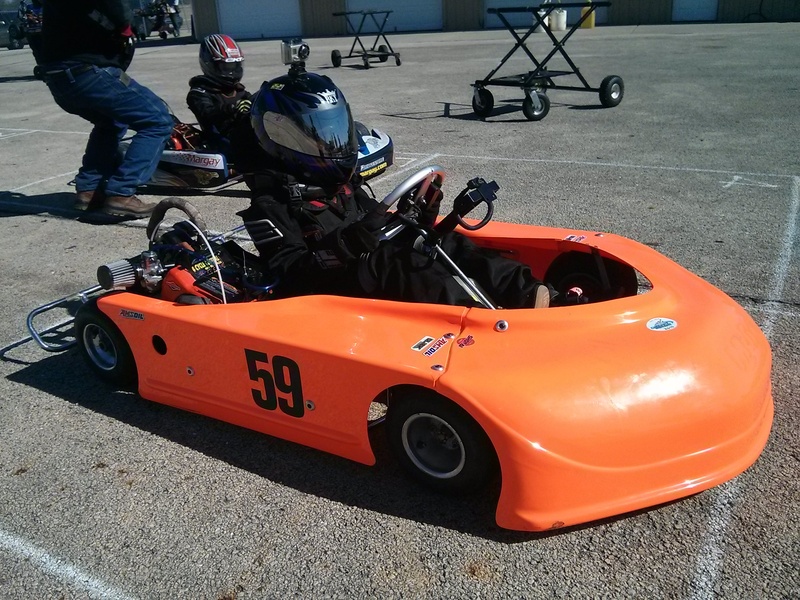 After getting the kart inspected, Jason hit the track for the first round of practice. Unfortunately, it did not last very long. Due to a oversight of the crew chief, there was no oil in the motor. After most of a lap it made a bad noise and seized. Jason and his kart had to take the tractor ride into the scale house. Luckily, we still had his old kid kart motor. With some help from Jason we got the motor installed in about 10 minutes and he was back on the track for practice rounds 2 and 3. His driving was pretty good and he seemed to be one of the faster ones out there but there were many new faces that my have been just getting warmed up. We really did not have much time to spend on tuning the new kart since we were concentrating on getting the kart around the track as much as possible to get a feel for it. Not only did we battle the busted motor and the cold, we have been having issues with the 360 collar not quite fitting right. It has been causing Jason’s helmet to rise up and interfere with his vision and put pressure on his neck and shoulders. This is the same collar that caused him to pull off in the first CES race 2 years ago. We were both pretty stressed out by this and it almost ruined the day, to the point where we considered going home after the drivers meeting. We tried on a number of collars in the shop and none made any improvement. We finally tried on Ryan’s collar which seemed to fit much better. We made some adjustments to the current collar to give it a slightly better fit, and added some caramel corn and soda. Jason soon recovered and was ready to go for the race day. Jason started Heat 1, by random draw, in the 7th position. This should give him a chance to see what the others could do and give him a chance to practice passing. The start, in classic junior style, did not go well. The novices were not well versed on start procedures and half of them did not take the cut off on the parade lap and took a full rap around. It was another 2 parade laps before they were even close to being sorted out. By then Jason was moved to 4th and the green flag was thrown. Jason made a good entry into turn one moving up to third. He spent the rest of the heat attempting to get around #42 Ryan who had fallen back to 2nd to from the pole. He was just not getting the timing right. In the 6th and final lap Jason made a charge at Ryan just before the hairpin. He made it by, but it opened an opportunity for #10 Daniel to slip by them both. As they approached the finish line It was a drag race as Jason and Daniel made the final charge to the finish. 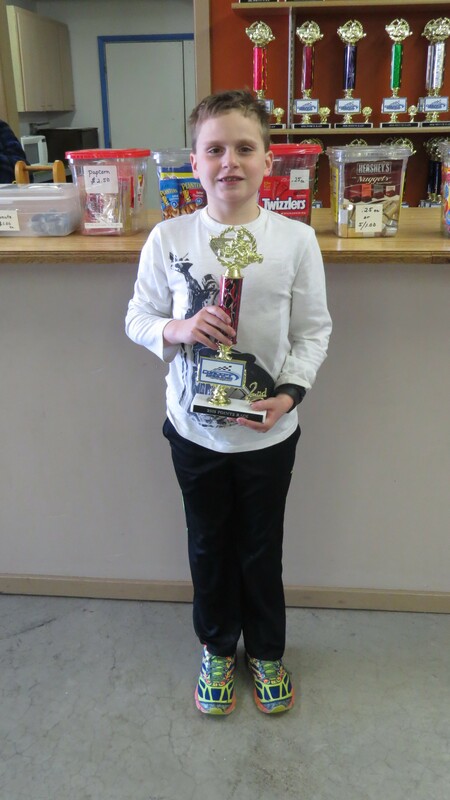 Jason came up short by just inches and had to settle for 4th. As usual heat 2 started the reverse of heat 1 with Jason on the pole. and #56 Chad is his was also in a bright orange kart. What you can’t see in the video are the drivers behind Jason and Chad who out again and where not able to maintain a rolling grid forcing the group to take second parade lap. This time on the around they were close enough and the flagman just let them go. Chad managed to beat Jason into the first corner and moved into first. For the first two laps Jason was dogged by Daniel until Daniel locked up his rear and spun off just before the hairpin. From then on it was Chad pulling away from Jason and Jason pulling away from #3 Kaleb and the remaining field until the end, with Jason finishing 2nd. At the scale house, they all got a much needed talking to by the race director about parade lap procedures, including Jason who did not slow down enough when directed. Between the last heat and feature I did some minor tuning and changed the rear gear to see if we could get a little more speed at the end of the straights. Jason started in second and Chad was on the pole. This time the parade lap was clean and they were off with out a hitch, Chad in first, Jason in second, and Ryan in third. Again they all pulled away from each otherm stringing out the whole field. In lap 9, Jason was getting ready to set up to pass and lap Yosel in the #15 as they entered the monza turn, and Yosel spun. Jason had to make a quick dodge to the inside as Yosel slowly rolled over the outer lip and down the back of the turn. The rest of the race was uneventful and Jason took his mighty fist pumps and checkered flag for 2nd place. Despite breaking some equipment it was a good day of racing. 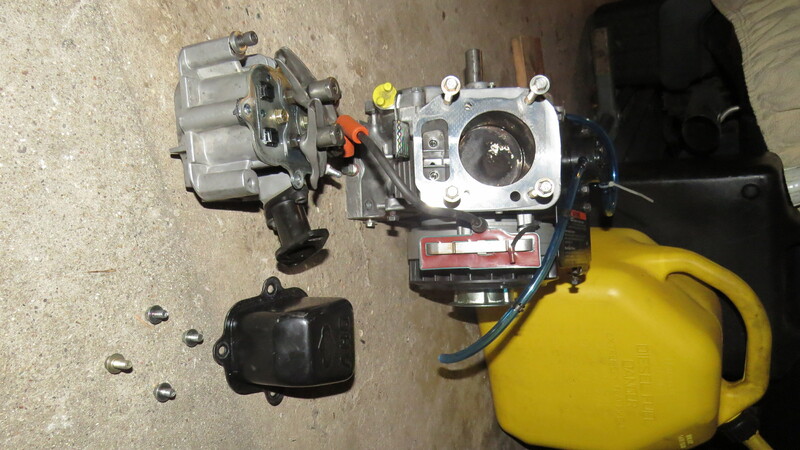 We were able to successfully field a new – to us – and untested kart . We managed to find a solution to a lingering problem with his collar. We still have some work to do to find those remaining seconds to get him up with the leaders but we at least have some plans and starting places to work with now. 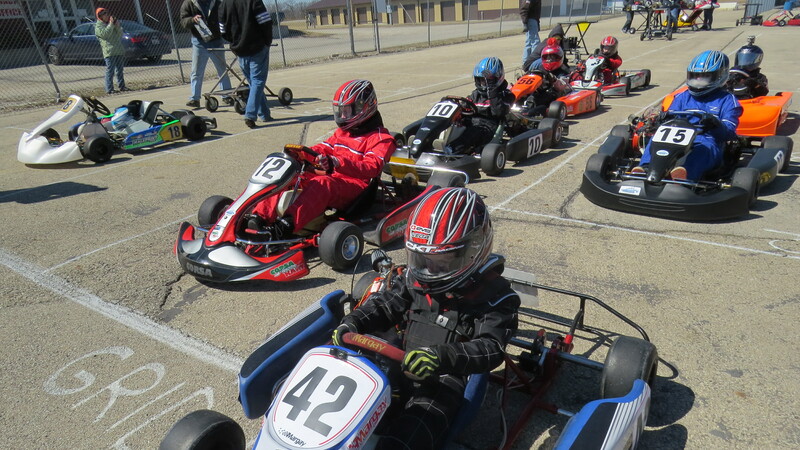 The next race is going to be at K1 Speed on Tuesday with the Jr League. The next track race weekend will be a doozy for us. We are planning to go to Race 2 at Concept Haulers on Saturday and then race both the LO206 class and the Animal class at Badger on Sunday. This will be a real test of whether or not we can put two classes together for the LO206 cup. Thanks Jason for letting me do this with him and learn to do these cool things. To Karen for not being too upset at the loss of the motor and even a little bit understanding. To the crew at Concept Hauler Motor Speedway for putting on a great first race of the season.